Electrons were spinning and spilling into the aisles as the Experiments and Demos session held rapt the attention of EMC symposium attendees. Now in its 18th year (! 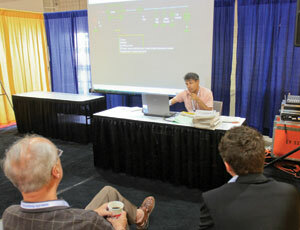 ), the topics ranged from hands-on practical to exploration of the new notions of EMC. All that chalk talk in school is fine for a theoretical understanding of fields and waves, but putting theory to practice is the goal of this important “hands-on” part of the symposium. A baker’s dozen of experts, recruited from industry and academia, held forth from Tuesday to Thursday in sizzling Fort Lauderdale. The Experiments and Demos sessions are organized by the Education and Student Activities Committee (ESAC), under the auspices of the recently-installed Chair of the ESAC, Tom Jerse, who is a Professor of Electrical and Computer Engineering at The Citadel in Charleston, South Carolina. 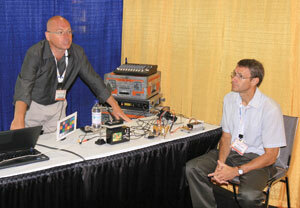 The Experiments and Demos feature of the symposium enhances EMC education by reinforcing the theory with practice. This well-received program continues to be one of the most interactive forums at the symposium with many in the audience taking the opportunity to ask questions and gain additional insight. Both hardware and software demonstrations were featured with several favorite key presentations from years-prior redux anno domini 2010. Steve Koster and Colin Brench get the organizational kudos. The popularity of the Experiments and Demos is to “show how, in most cases, fairly simple test hardware can be used to measure a wide range of electromagnetic effects.” Bench-level, core concepts can be worth a thousand words (or more); here are a few words about that action. EMC Troubleshooting techniques were demonstrated by Ken Wyatt (he of photo and snare drum fame). Ken’s practical and hands-on advice has been leveraged by many engineers who have either attended his demonstrations or discovered enlightenment in his seminars. Ken hails from Woodland Park, CO, on the edge of Pike National Forest—a one-second flight west of the US Air Force Academy (in a T1A Jayhawk, that is). EMI at the PCB Level. Isn’t this where all the trouble starts: at the PCB Level? If you get a grip on the volts, amp and hertz (or microvolts, milliamps and megahertz), you’re a long way towards avoiding problems at the device and system level. Insight was provided by Mr. Frank Leferink, University of Twente (“Developing high tech, with a human touch”), Enschede, The Netherlands. MIL-STD-461: Demonstration of Test Methods CS115 and CS116. Pow! Lightning and EMP can ruin your day, if you haven’t done enough testing to make sure your conductors are properly protected. 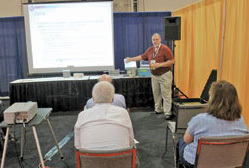 Steve Ferguson, Washington Laboratories and Tom Revesz, HV Technologies, Manassas, VA, have teamed up for the third straight year showing how to properly whack your equipment to make sure it stands up to the rigors of real life. Improving EMC Test Productivity with Automated EMC Test Software. Faster and better, right? Isn’t that what the world wants? In the quickened-pace of product development, getting results with better efficiency, ease and comprehension shortens the test, leans development time and improves product delivery. Techniques demonstrated by Joe Tannehill, EMC Software Engineer, ETS-Lindgren, Cedar Park, Texas prove how. 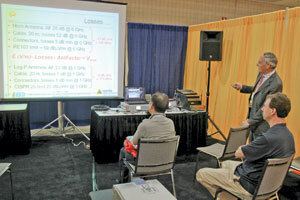 An experiment showing novel methods for high speed EMI testing and time domain measurements by Dr. Wolfgang Winter, of emv GmbH, Bavaria Taufkirchen, Germany drew a large audience. Professor Bogdan Adamczyk (left) of Grand Valley State University joined Jim Teune of Gentex Corporation for a hardware experiment showing grounding strategy effect on video and audio circuitry. 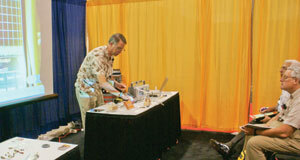 Steve Ferguson (right) of Washington Laboratories and Tom Revesz (not pictured) of HV Technologies provided a MIL-STD-461 demonstration on CS115 and CS116 test methods. Faster and better emission tests using an antenna-mounted receiver with a digital fiber optic link was demonstrated by Domenico Festa (standing far right). 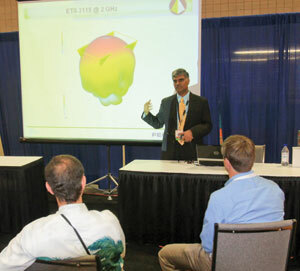 Dr. C. J. Reddy of EM Software & Systems (USA) Inc. provided a software demonstration of antenna design tools for EMC applications. Mohamed Ramdani of ESEO, Angers, Maine and France introduced a freeware tool, named “IC-EMC,” which aims at simulating parasitic emission and susceptibility of integrated circuits. 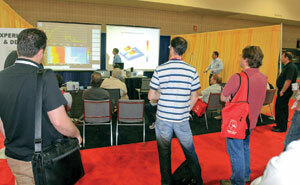 Demonstration of Antenna Design Tools for EMC Applications. Complex, multi-transmitter platforms are the norm. Take the ubiquitous SmartPhone in all of its forms – and all of its communications modes: CDMA, Bluetooth, Wi-Fi and multiple types of antennas: wire, patch, integrated antenna systems – the need for informed antenna placement is critical. Dr. C. J. Reddy, EM Software & Systems (USA) Inc out of Hampton, VA discussed the use of tools to optimize the design process. IC-EMC: A Freeware Tool for EMC Assessment in ICs. Mohamed Ramdani, ESEO, Angers, Maine et loire 49000 France introduced a freeware tool, named “IC-EMC,” which aims at simulating parasitic emission and susceptibility of integrated circuits. The full package can be downloaded from www.ic-emc.org, a non-profit site dedicated to EMC of integrated circuits. Free? We’ll take free and all the better for improving our designs before we cut steel (or silicon, in this case). Automated Measurement of RF System Performance for Co-Site Interference Evaluation. Co-site issues are sprouting like dandelions – or more like cell towers. The overlap of physical space on crowded transmission platforms means that system-to-system interference is more likely. Fred German, Delcross Technologies, Champaign, IL, demonstrated an automated measurement system for obtaining wideband system performance characteristics and showed how these data can be used for co-site interference evaluations. As with any metric, once you can measure it, you can correct it. Faster and Better Emission Tests Using Antenna-Mounted Receiver with Digital Fiber Optic Link. Domenico G. Festa, IBD, Chiari, Italy brings a novel bent on emission testing: using a receiver mounted on the antenna, controlled via a digital fiber optic link. Some of bennies are certainly improved sensitivity. Other good advantages were detailed by Sr. Festa. Fantastico! Performance of Real Components. When is a capacitor not a capacitor? Mike Violette, Washington Laboratories Ltd. Gaithersburg, MD answered this question with a visual demonstration using a swept network analyzer. Conditions of resonance, parasitic quantities and when not to use an 18 gauge green wire were aptly demonstrated. In the audience: audio techs from the Broward County Convention Center, who weighed in on their own challenges. Ken Wyatt provided some helpful advice with his “EMC Troubleshooting Techniques” experiment. 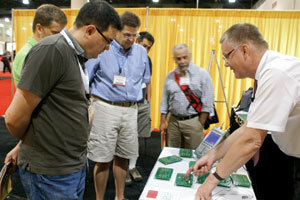 Frank Leferink (far right) of the University of Twente in Enschede, The Netherlands, demonstrated EMI issues at the PCB level. Novel Methods for High Speed EMI Testing, Time Domain Measurements. Dr. Wolfgang Winter, emv GmbH, Bavaria Taufkirchen, Germany demonstrated the use of Time Domain Measurement Techniques applied to traditional radiated and conducted emissions testing. With the wide spread use of RF communication systems to transmit data, audio and TV signals, new challenges are born for product development in industrial, home and automotive applications. To capture transient and time-limited complex RF signals is difficult, because they are often closely related to the operation of the DUT. 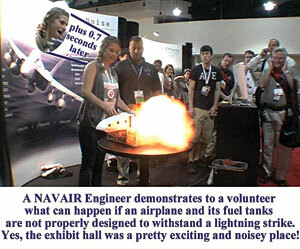 New methods were fleshed out by Dr. Winter in this demonstration.